President Donald Trump delivers his first State of the Union address in the House chamber of the U.S. Capitol to a joint session of Congress, Jan. 30, 2018. Despite being strongly discouraged by House speaker Nancy Pelosi from delivering a State of the Union speech next week to both chambers of Congress, the White House is moving ahead with plans for President Donald Trump to deliver a televised nationwide address on the evening of Jan. 29. "At this point we're moving forward" on the president delivering a State of the Union address on Capitol Hill next Tuesday, White House press secretary Sarah Sanders told reporters Tuesday evening. In anticipation of a speech from the Capitol, an email request by the White House was sent on Sunday to the sergeant-at-arms of the House for a walk-through planning session, according to an administration official speaking on condition of not being named. Alternative plans are also under way for the annual address to be made from a different location — including at a political rally — depending on whether the partial shutdown of the U.S. government persists, White House officials add. 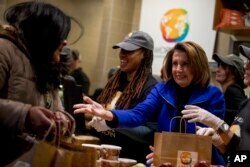 House Speaker Nancy Pelosi of California, center, helps give out food at World Central Kitchen, the not-for-profit organization started by Chef Jose Andres, Jan. 22, 2019, in Washington. "Nancy Pelosi does not dictate to the president when he will or will not have a conversation with the American people," White House Deputy Press Secretary Hogan Gidley said earlier Tuesday on Fox News. Pelosi last week urged Trump to postpone the speech or to submit it to lawmakers. She expressed a security concern, noting the U.S. Secret Service and Department of Homeland Security are part of the one-quarter of the U.S. government remaining unfunded since late December. The White House denied there would be any issues with adequate security for the event, despite the shutdown. In a move seen as retaliation against the House speaker, Trump stopped Pelosi from using a U.S. military aircraft for a congressional delegation visit to American troops in Afghanistan. Trump on Sunday tweeted "there are so many options" that he is considering. The State of the Union speech has been a prime-time televised live address from the Capitol only since the era of President Lyndon Johnson in the 1960s. He moved it from earlier in the day to the evening for a maximum number of TV viewers. 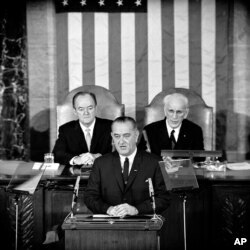 In this March 15, 1965 file photo, U.S. President Lyndon B. Johnson addresses a joint session of Congress in Washington where he urged the passing of the Voting Rights Act. Franklin Roosevelt, the country's only four-term president, was the first to begin referring to it as a "State of the Union" message during the Second World War and the name was formally adopted by his successor, Harry Truman, in 1947, the first year it was televised. Prior to that it was referred to as the Annual Message. In 1913, Woodrow Wilson revived the earlier practice of delivering it in person. It was first broadcast on radio in 1923 by Calvin Coolidge. Only two presidents have never presented a such an annual message or speech: William Henry Harrison who died within a month of his 1841 inauguration, and James Garfield who was assassinated in 1881 only six months after taking office.